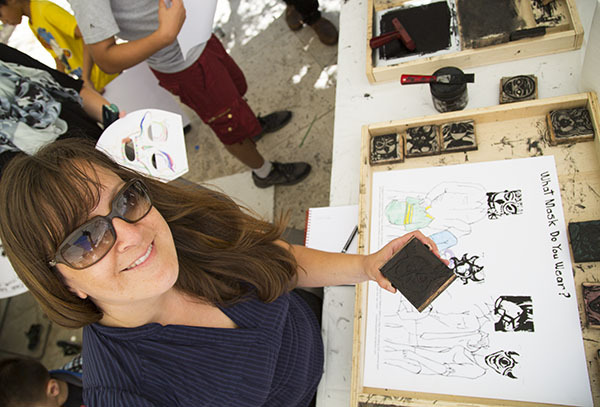 A contemporary printmaking project inspired by James Ensor and his wild masks returns to the Getty Center on August 1 and 2. Come join in! 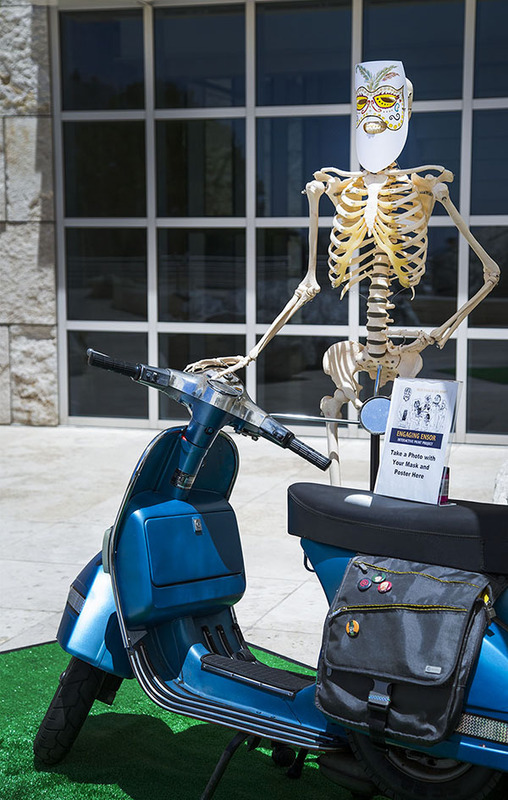 How do you walk past this skeleton on a moped? On a sunny day in July, a canopy of umbrellas popped up in the Museum Courtyard at the Getty Center. A talkative crowd of all ages gathered under the shade. My curiosity piqued, I walked over and noticed an unusual happening on the pristine travertine grid of the plaza—a vintage Vespa scooter attached to an interactive, social sculpture inspired by the design of a classic teardrop trailer. The trailer had unfolded to become a printmaking station, and artist Peter Foucault manned the cart creating posters and mask imprints. 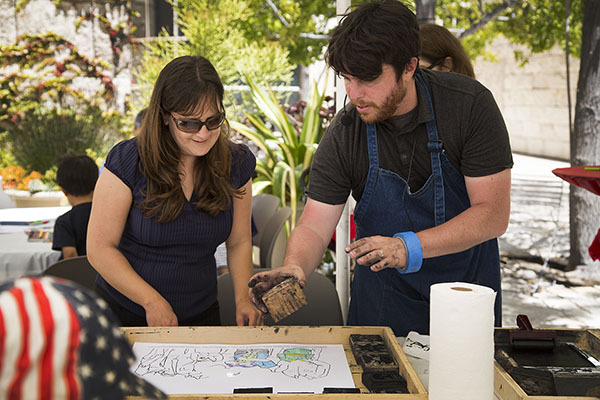 His fellow artist Chris Treggiari milled through the crowd, helping those at the stamping station apply ink and creating a cheery and unintimidating environment. These posters and masks connected the art being made outside to the art of James Ensor hanging inside. If you haven’t heard of James Ensor, we are talking about a rebel of a 19th-century artist from Belgium. Ensor’s drawings, paintings, and prints have been described as scandalous, grotesque, eccentric, and satirical, and he often used masked figures to criticize social norms. Invited to collaborate with the Getty Museum’s Education Department as part of its ongoing series of artist-based programs, the founders of MAP (Mobile Arts Project), Peter and Chris, created posters with two slogans: “What Mask Do You Wear?” and “Together We Can Unmask _________ in Our Community.” Along with the slogan, the posters featured a crowd of headless people. 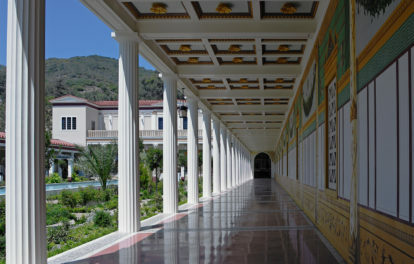 It is the participant’s job to give color and life to these creations. Finished with my coloring (ok, ok, I only colored in a portion), I made my way over to the stamping station. Here Chris helped set me up with a selection of square rubber stamp masks. 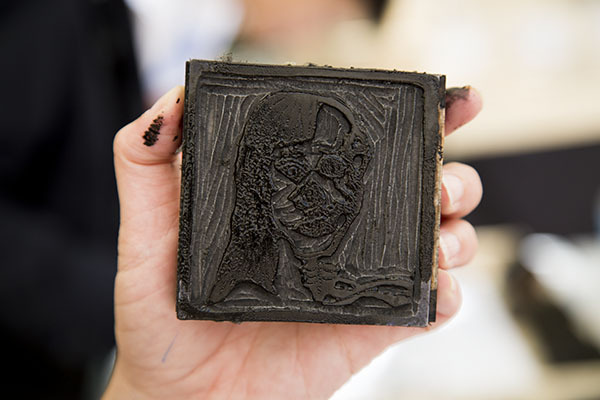 Notably, over 70 local and national artists contributed to the creation of the masks on these lino block stamps, making each one special and unique. To gather the mask stamps, Chris and Peter put out an open call to artists in the Bay Area, Los Angeles, and beyond to mail a custom 3″x 3″ lino block mask face with an original design. They also reached out to Brian Lane, co-founder of Print Zero Studios in Seattle, Washington. Art Hazelwood, a printmaking instructor at the San Francisco Art Institute, also got his students involved in creating the blocks. 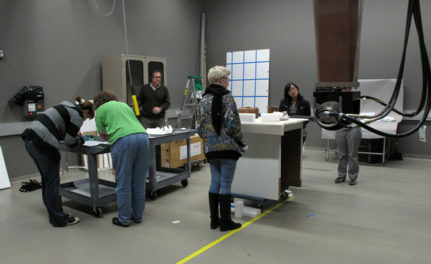 The final accumulation of lino blocks was assembled when MAP held a two-day workshop at Art Division. Chris showed me how to saturate the roller with ink and apply the mask stamps to the posters. There were so many cool masks to choose from, my favorite being one of an owl’s head. I was also drawn to (and posed with) a half-skeleton doppelganger of me! 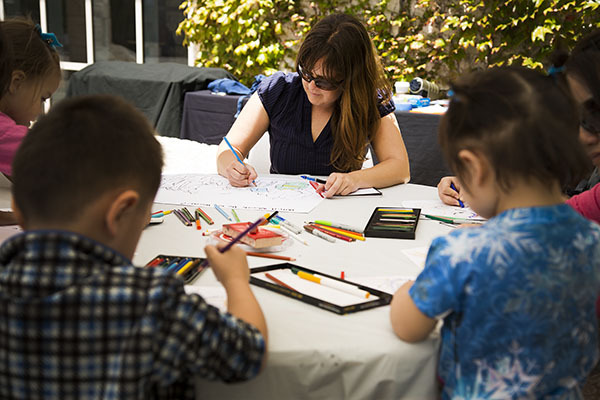 Join in this fun interactive project when the MAP team comes back to the Getty Center on Friday, August 1, and Saturday, August 2. The event is free, no reservations required; just look for the umbrellas.